Tomorrow's Polite Society event will discuss Bomb situations. I wanted to share some old discussion notes from the event held shortly after the Boston Marathon incident. These are rough Polite Society Discussion notes. o In one bomb class a bomb was concealed it in a flowerpot with a live plant covering it. It triggered with a motion detector that detonated the bomb when someone came within feet of the flowerpot. o If the terrorist wants you blown up badly enough, he’ll succeed and you’ll never know what hit you. o Hands hidden (possibly holding the switch to detonate the bomb) Glove?!!! o The bomber focused, but unresponsive. o Heavy luggage or backpacks that don’t fit the situation. § The average weight of a bomb used by a suicide bomber is around 20 lbs. § The Madrid train bombers all had very heavy backpacks. § The Moscow bomber placed his bomb in a rolling suitcase. § Not all the bombers wear their bombs. · Beware of any suspicious packages. o The bomber might not be a suicide bomber. He or she might plant the bomb and walk/drive away. § Dangerous within 400 meters! · If you are within 15 meters of the bomber when he detonates, you will likely die. · If you are beyond 15 meters, you will likely live, but be seriously injured. § Ideally, distance combined with some type of cover that will stop shrapnel and projectiles is best. o For the 500kg Oslo car bomb, people were likely hit by shrapnel up to 1/2 mile away! o Primary objective is to get yourself and loved ones as far away from the bomber as possible. o Once you’ve made it to safety, report the person to police. o Don’t hang around in the kill zone looking for a policeman. · If you are armed with a firearm, should you shoot the bomber? o If you are right about your guess and kill the bomber before he detonates, you will be a hero. o If you are wrong you will be either blown up or arrested. o If you decide to shoot the bomber, expect to die. § Remember that danger zone of 400 meters I talked about earlier? 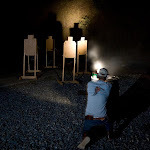 § How many of you can make a headshot at 400 meters with your concealed carry pistol? § If you can’t, you are in the kill zone. § If the bomber detonates you will be seriously injured or killed. § By definition, if you are close enough to take a shot, you are going to be within range of the bomb’s blast. o If you do shoot the bomber, you must go for a head shot. § If he is wearing a bomb vest, your bullet will likely detonate the bomb if you hit it. § Even if you instantly incapacitate the bomber with a brain stem shot, the bomb still may detonate. · Your bullet could cause it to blow. · The possibilities are endless. § You don’t know how the bomb is set to go off. § If you engage you have to expect to be blown up. o You need to decide what you are going to do BEFORE it happens. § Study the subject and make your decision now. § You won’t have time to consider all the variables in the heat of the moment. o Often terrorist bomber have “handlers”, “dispatchers”, or security people assigned to them. § The role of these people is to protect the bomber in case anyone intervenes or to detonate the bomb if the terrorist gets cold feet. § Scan for anyone who appears to be paying undue attention to the situation, especially if that person is behind some type of cover or at a discreet distance away. § If you choose to shoot, you may be in a fight with more than just the bomber! o When deciding to take the shot, not only are you dealing with a bomb, but you may have to fight five other people as well. § Look for people watching who are not scared or stunned or on cell phones. § Be cautious of people in uniforms. o fire department uniforms telling you to do what doesn’t seem safe. · Use your common sense and flee if you think it’s a ruse. o If you shoot the bomber, or even if you just see the bomber blow up, do not approach the body! § Command detonated by another person. o Try to get everyone else away too. o Move quickly to cover after you shoot or he blows up. o Resist the temptation to open any potential bomb to see what it is. § Russian bomb was triggered by the act of the bomber opening the suitcase. § If you think it’s a bomb, then treat it like a bomb! § Get away and get to cover! o Beware of the secondary device. § Bombers can use more than one bomb. § The original bomb is just designed to create havoc and bring in first responders. · near the body designed to injure more people, specifically fire and police officers. o NEVER EVACUATE TO A PARKING LOT! § Cars are the easiest place to hide large amounts of explosive for a secondary device. § One very common tactic is to place a small bomb in or near a building or public area. § The terrorist knows that the small bomb will trigger an evacuation. § He will then place a bigger bomb at the evacuation site to blow up all of the evacuees. § It’s easy to hide a (big) bomb in a car. o You will likely see deaths and serious injuries. § victims not be able to walk or hear you. o Expect that and don’t be stunned. § There are several videos of the immediate post blast of the Oslo bombing. o This is one time when laying injured persons down to prevent spinal injury is counterproductive. § There may be a secondary device in the area. § Bombing victims seldom have the types of injuries that are aggravated by movement. § Get the injured to a safe place so that they aren’t blown up again! o Establish a casualty collection point behind some hard cover in an area that is as far away from the original bomb as possible. § Clear this area of secondary devices before unloading casualties. § It may take a while for EMS to enter the scene. · Follow up with airway and breathing stabilization and other injuries. o Improvised bandages and tourniquets.